Later start today as the rest of the campers didn’t arrive until lunch time for their summer camp. The jamboree has about 110 people at it and about 80 of them are Scottish, 8 Ugandans and the rest are Americans. On site there are also about 300 other Americans at their summer badge camp. Breakfast was sugar filled, think we all had our daily allowance in the one go but it was quite good. There was nothing planned for this morning so we ran a basketball tournament and some basketball based games for the jamboree with lots of water breaks, it’s very hot!! Everyone seemed to enjoy themselves. Lunch today was a hot pocket and come crisps, nothing too exciting, I think this is a sign of things to come food wise. After lunch we got a campsite tour before out BSA swim test before moving to the Native American village on site to hear about what they offer activity wise. 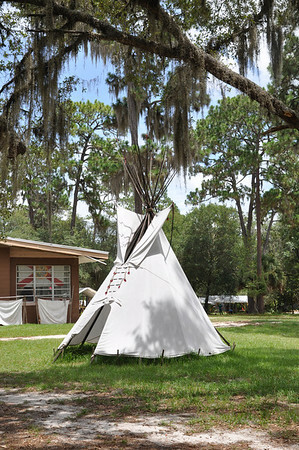 They offer lots of activities including traditional cooking, hunting skills, weapons and survival skills. Dinner tonight was a burger and a hotdog with crisps. After dinner we filled the time played cards and games which we supplied by the jamboree teams to keep us amused before bed.